I have featured lots of jewelry on my blog in the past, but nothing quite like what I am featuring today. Mystic Pieces has some of the most unique and inspiring jewelry I have come across online. It has an old world charm that will bring you back to a different era as you browse through her store. Shelly is the artist behind Mystic Pieces and has a real talent for her craft. Her jewelry is inspired by both art and history including the Victorian Era, Roaring 20s and Industrial Age. 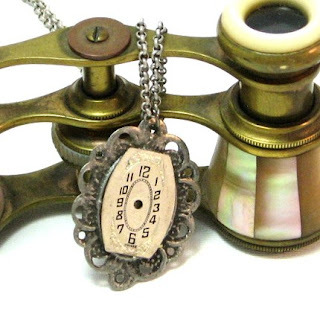 It really is time travelling jewelry! 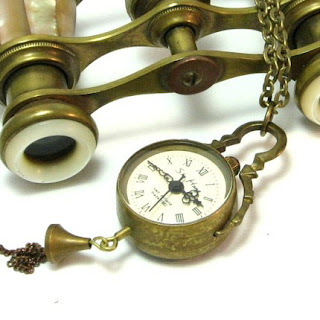 Mystic Pieces has Steampunk Necklaces, Rings, Earrings and more. Most of the pieces are one of a kind and made from vintage pieces that are 40 years old or older. I received a gorgeous Steampunk Necklace for review. 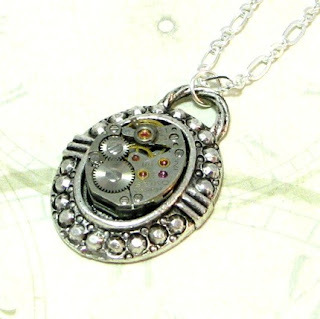 The pendant is the inside of a vintage watch. Its unlike any jewelry that I currently own and I love it! It’s both romantic and timeless and looks great with many outfits. I’ve had many people comment on how beautiful it was and how it was so unique. I can see this particular necklace being passed down from generation to generation and enjoyed for years to come. Plus, the prices are reasonable and you can get a nice gift without going broke. Check out Mystic Pieces and prepare to be whisked away to another world! I love the Rich Ruby Luster earrings…and the butterfly necklace! blog follower via gfc as khrista porcadilla. following mystic pieces on twitter as bellekhris.